Honour Student is at last joining the IJN roster! Hit points - 15100, plating - 19 mm. Main battery - 3х2 127 mm. Firing range – 10.9 km. Maximum HE shell damage – 1800. Maximum AP shell damage - 2200. Reload time - 9 s. 180 degree turn time - 30 s. Maximum dispersion - 97 m. HE initial velocity - 915 m/s. AP initial velocity - 915 m/s. Sigma value - 2.0. Torpedo tubes - 2х4 610 mm. Maximum damage - 20967. Range - 10 km. Speed - 67 kt. Reload time - 112 s. Launcher 180 degree turn time – 7.2 s.
Maximum speed - 35 kt. Turning circle radius - 640 m. Rudder shift time – 3.6 s. Surface detectability – 6.6 km. Air detectability – 3.8 km. Detectability after firing main guns in smoke – 2.5 km. All stats are listed without crew and upgrade modifiers. So, is she a T8 Premium, or will she join the tech (gunboat) line, sending Akizuki one Tier upwards? And if she's a T8 Premium, how bad will WG mangle her? I mean, she's pretty much a worse a worse Kagerou at the same tier so she's already mangled. Good luck selling that if it's a premium. I'm really hoping that she's going to take Akizuki's place at T8, with Akizuki moving to T9 and super Akizuki at T10. On the plus side, the camo looks rather cool. At least it's not the usual vomit green of other IJN camos. While its a pretty useless thing most of the time, i do wonder why every IJN dd premium comes with no AA at all. And given how weak her guns and torps are can't see her being to competitive at the moment. Akizuki will need quite a lot of buffs to work at T9, since she can't outrun anything. Heal and the Germans' 1/4 calibre pen? @Keyan_TTK DFAA, unnerfed HE (Akizuki's HE has lower values than the ones on Zao and Hakuryuu), buff to maneuvrability (especially turning radius) and I think she would be good enough honestly. Yeah she'd still be slow, but with DFAA she could wreck CVs attempting to drop her and better maneuvrability would make her significantly less vulnerable. And with the unnerfed HE, you'd have a DPM monster. 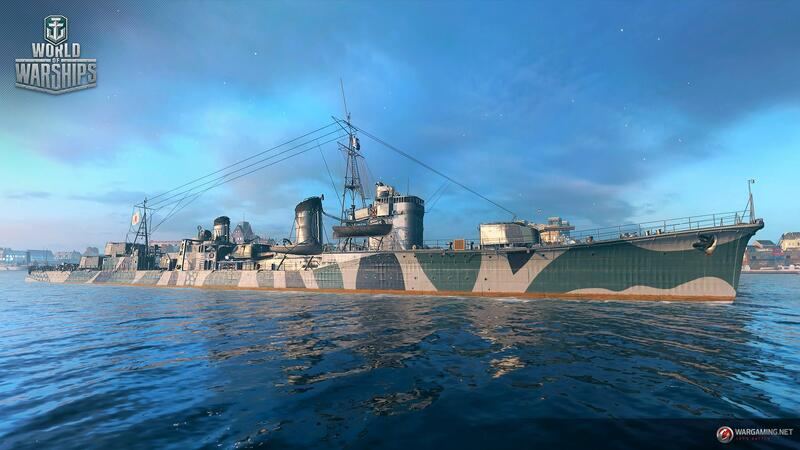 @Mobius I wish the perk of the Yamamoto campaign for changing camo tint applied to the perma-camo as well. 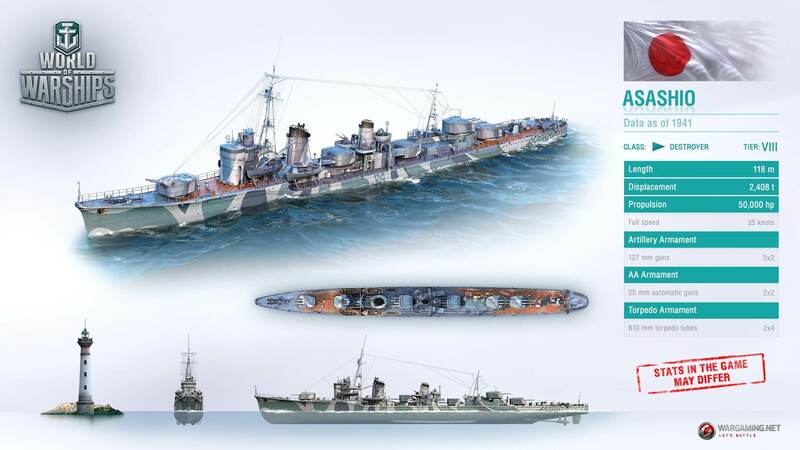 Q: Any chance of adding the second colour option that you get whit the Yamamoto collection to premium camoes as well, like Zao or Yamato's premium camo. A: You know, yes, there is a chance. The mechanics is not here, because permanent camos work a bit differently from regular ones in terms of their texture application, so adding customization option requires a lot of additional work - hence, it was not present initially. But as we see, overall color customization is quite a thing for many players, so implementing it for permanent camos sounds reasonable. We will try to do it, probably in the beginning of 2018. Honour Student got Deep Water Torps! Deep water modification of Type 93 torpedoes is equipped. Can only hit battleships and carriers. Rate of fire - 0.5 launches per minute. Reload - 112 seconds. 180 degree turn - 7.2 seconds. Maximum damage - 20966. Speed - 67 knots. Range - 20 km (instead of 10). These changes are designed to make the ship's gameplay more unique in relation to the Kagero destroyer. Lo Yang would like to meet Asashio as soon as possible. Only BB's and Carriers? and what's the detection range on those torps?